Confessions of a Ribbon Addict: Step Away From the Pumpkins, Jody! Step Away From the Pumpkins, Jody! As for the sewing, I cannot make the same promise. I am mildly obsessed. LOL Have you gotten a Janome sewing machine yet? If not... WHY NOT? I LOVE that little thing! It is a purchase I do not regret. For this card, I put a tiny piece of adhesive down for the back layer and then sewed around it leaving an edge of patterned paper for me to pull up a little on the edges. I used the same lovely May Arts ruffled ribbon. Watch for that as part of a share in October. :) I also have some great other ribbons in the line-up. :) I used my quickie glue pen to outline a few parts of the pumpkins. Then I dumped some Art Institute pumpkin glitter (part of my current opaque share). Then, I grabbed a clean sponge and wiped away the "chunky" parts of the glitter leaving only smooth lines of glitter just to add a little bling to my card. ohhh pretty! Love the glitter! It's gorgeous!! And you just sew away!! Well, I've been on a pumpkin kick, too (and it's not over yet, LOL!) so I totally sympathize! All of yours are gorgeous, Jody! And that Bailey is a riot! I love the pumpkins. They all look so different and beautiful! These are stunning. You do such beautiful work. Thanks for sharing. OMGosh! Why do I NOT own this stamp????? I love it!!! Hope you are having a good day! I am bringing you an All About Manda page (6x6) when I come to SLC! Sorry I took forever and was a slacker. Maybe we can start swapping again in the new year after I get settled from moving. Can't wait to play in a week! SMILE! I love the pumpkin stamps! and your colors are beautiful! Makes me want to get all my fall stuff out. Absolutely gorgeous! If it's not broke . . . ;) P.S. - you've been tagged! Oh wow, this is incredible!!! Just gorgeous! This is stunning. It looks like an art still-life. WOW! Great idea to add the subtle glitter; that takes it to the next level of interest. LOVE love love it! :0) Mel. Fabulous, Jody!! Your cards are always stunning! 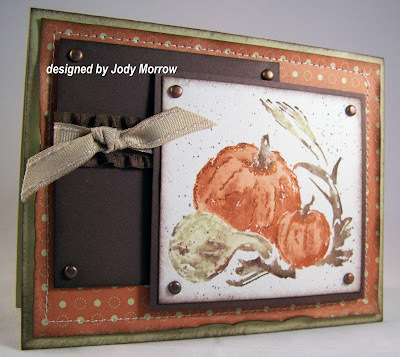 What a gorgeous fall card! Ohhh, please don't stop using this stamp! I love what you are doing with it...just gorgeous! Do NOT step away from the pumpkins! You do such nice coloring and have such wonderful texturing and stamping.